The 2014 ECLA annual conference was a wonderful success! 105 people attended from 8 states. College Church in Wheaton is a beautiful church and it was truly a blessing for them to host our event this year. ResourceMate, a library automation system. Susie Wing and Ceil Carey presented a workshop on the topic of quilting with Suzy demonstrating beautiful quilts she had made along with their back stories and Ceil booktalking Christian fiction about quilts or quilting. Friday night David and Diane Munson (authors and former NCIS agent and Federal prosecutor), hosted a Mystery Dinner which was a first for ECLA. Almost everyone rated this event as 5 out of 5 and we heard comments such as excellent presentation, fun idea and fun evening. The conference started back up again at 8:15am on Saturday morning. The first session was “Publishers Present: New Books Preview.” We heard directly from the publishers about many new and interesting titles coming out this year. I know I came out with a long list of titles I hoped to add to my library. This was followed by our first breakout session with 6 choices to attend by such authors as David and Diane Munson, Julie Ieron, and Caryn Rivadeneira. 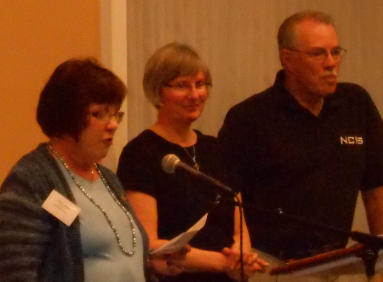 We also heard from Melody Green (an ECLA favorite) on the topic of which classics to keep in your church library. 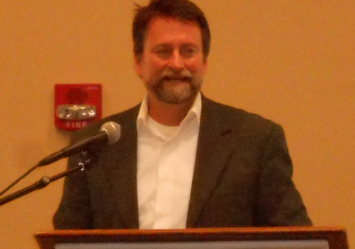 The keynote message this year was delivered by Danny Lee from Crossway Publishers. His topic was “The Call to Serve and Point: The Ministry of the Church Librarian.” It was a very encouraging and motivational session. This is what we heard from those who attended: awesome speaker, excellent, thank you for encouraging us, powerful, passionate, dramatic, great, wow, a “10.” A recording of Danny Lee’s message will be available soon. After lunch, there were two workshops to choose from: Chris Jager, fiction buyer at Baker Book House, presented a long list of fiction titles and described who would most likely enjoy each book. If you missed it or want more, visit Chris’s blog at http://bbhfiction.blogspot.com/. At the same time, Diane Fischer presented a list of nonfiction titles for the library. 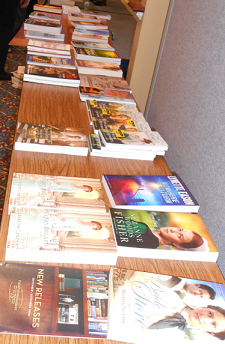 Participants left these workshops with new free books to add to their libraries. The last break out session featured 6 more workshops including Kathy Dejong’s presentation of nonfiction titles for young readers and Rosalie de Rosset, Moody Bible Institute literature professor, talking about book clubs. Rosalie hosts an on-air book club on Moody Radio. You can access her reading list and study questions, and listen to past programs at http://www.moodyradio.org/brd_ProgramMainPage.aspx?id=7058. Board members and public librarians Tinna Mills and Christy Ewing presented a workshop entitled “What’s Next? The Future of Libraries. Technology and ECLA.” Those who attended said: lots of ground covered, useful comments and mini discussions and lots of good practical information. At the end of the day we all gathered again for the New Books Giveaway. Thanks to the publishers who donate these new titles to us, each person takes home at least 3 brand new books. By the time the conference was over, most of us had boxes of books either free from the wonderful book swap area, purchased at a generous discount from the onsite Lifeway bookstore or from the publishers who attended, or new free books form the book giveaway or from workshop sessions. By the end of the two days we were all anxious to get back to work at our libraries and try out some new ideas and get new books ready for patrons. Wow! Sounds like a great time! Wish we had a program like that out west! Thanks Joanne – we always have a wonderful weekend! Not sure how far out west you are but there is ECLF in Southern California http://socalchurchlibraries.org/. Otherwise I hope you enjoy our online presence at both the blog and on Facebook!